Environment Technology Systems Division | ANDES ELECTRIC CO., LTD.
We are focusing to provide comfortable, safety and secured indoor environment by eliminating bacteria, viruses and harmful substances. 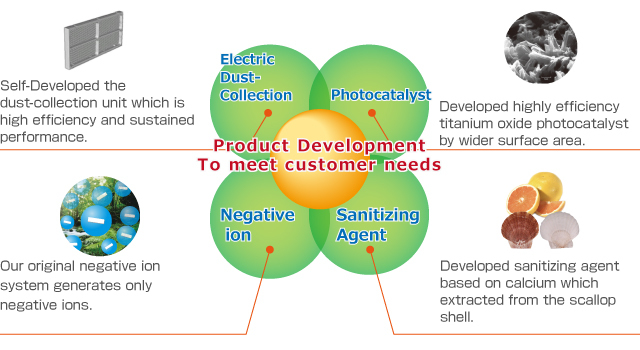 It is our unique advantage that we can develop the key components by ourselves for our products. We can facilitate flexible and fine response to the diverse customer’s needs in providing our original products “Air Purifier built-in rectangular columnar titanium oxide photocatalyst and negative ion generator”. We will continue to make full effort to develop new products for providing comfortable environment and energy saving equipment to our customers.